Biblio Couns Jurnal Kajian Konseling dan Pendidikan is an open access journal by the Departement Guidance and Counseling, Faculty of Teaching and Education, University of Muhammadiyah Sumatera Utara (UMSU), Medan, North Sumatra, Indonesia. which includes articles on the scientific research field of Guidance and Counseling, includes the results of scientific research original, Biblio Couns Jurnal Kajian Konseling dan pendidikan accepts manuscripts in the field of research includes scientific fields relevant to: of School Counseling, Psychology Counseling, Career Counseling, Couple, Marriage and Family Counseling, Mental Health, Counseling Supervision, Theory Development, Professional Counseling Ethnic, International Counseling and Multicultural Issues, Program Applications; and Integrative Reviews from Counseling and Related Fields. 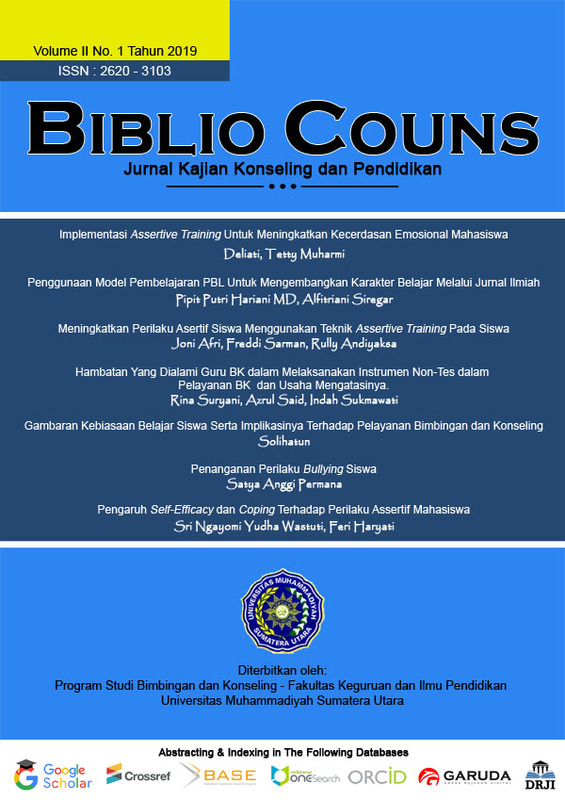 Biblio Couns Jurnal Kajian Konseling dan Pendidikan published three edition a year in March, July, and November.